Are Balochs Being Re-Branded As “Al-Qaeda”? QUETTA: Authorities in Quetta said on Thursday that they had detained at least six “international terrorists” linked with Al-Qadeda while trying to enter Quetta on their way from border town of Chaman. According to officials, six suspected Al-Qaeda terrorists were arrested while entering provincial capital Quetta. They were caught on the basis of information provided by the intelligence sources. Officials said they had discovered maps, laptop computers and discs from the custody of the foreigners who intended to blow up buildings and other installations inside Balochistan. The head of the group was identified as Alam Najeebi while most of the arrested suspects were reported to be Uzbek nationals. Authorities said the suspected Al-Qaeda activists had been shifted to an unknown location for further investigations. They said they were hoping to find out the names and locations of more terrorists during interrogations. “Important revelations are expected during the investigations,” said one official requesting anonymity. QUETTA, Dec 22: In a deve- lopment with far-reaching implications, paramilitary troops arrested on Wednesday Nawabzada Shahzain Bugti, a grandson of the late Nawab Akbar Khan Bugti and president of the Balochistan chapter of Jamhoori Watan Party, along with several personal guards, after finding a huge quantity of illegal arms and ammunition in vehicles of his convoy coming from the border town of Chaman. “Mr Bugti and his armed guards did not offer any resistance when security forces took them into custody,” General Obaid said. Law enforcement officers also searched Kvachkov’s apartment before detaining him, his lawyer Alexei Pershin told the news agency. Kvachkov was earlier questioned by the FSB for calls to overthrow the government allegedly made by a member of the Minin and Pozharsky’s Public Militia group, which he heads, Interfax reported, citing Kommersant. Chubais, an architect of the liberal reforms in the 1990s, is reviled by many for the chaos that accompanied the country’s rapid transition to a market economy. Detained and subsequently arrested Vladimir Kvachkov, the main person involved in the case of the attempt on Anatoly Chubais, who was acquitted court . Now he is suspected of facilitating terrorist activity and attempted to organize an armed rebellion, reports “Interfax” . 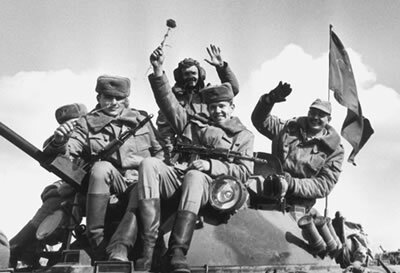 “The Russian revolution is inevitable!”, – Said Kvachkov, when the court announced the decision to arrest. Happy Tuesday Kvachkov himself and his lawyer were told that home to the Colonel came twelve siloviki – FSB investigator with a search warrant and the police. First, investigators have not reported in any criminal proceedings are conducted these acts.But in the decree of the search contains language that Kvachkov impute the preparation of an armed rebellion. Kvachkov locked himself in his apartment, in connection with which there called experts MOE for hacking. While it is unclear whether the door had to hack, or Vladimir Kvachkov voluntarily left the apartment and went to a detainee in court. The apartment is planned searches. According to the most Kvachkov, “plans are going to look for an armed uprising, weapons and ammunition.” In turn, the lawyer Kvachkov Aleksey Pershin, was quoted by RIA Novosti news agencyconfirmed that his client wants to take into custody and accused of organizing an armed rebellion. Kommersant newspaper earlier reported that the FSB is investigating the case “of public appeals to violent change of constitutional order” (Article 280 of the Criminal Code), allegedly committed by one of the members of “militias behalf of Minin and Pozharsky. Leader of this movement is Kvachkov, he was interrogated. On Thursday the Federal Security Service confirmed that a criminal case against Kvachkov. The court clarified that part 1 of article. 205 approx. Criminal Code says about the decline, recruitment or persons involved in the commission of terrorist activities. The Court considered the petition of the investigation of the arrest of Vladimir Kvachkov behind closed doors, because the materials secret. Late in the evening it became known that the arrest warrant was issued. The term of arrest is set to February 23, 2011. The retired colonel was taken into custody in the courtroom during a meeting he was not handcuffed and was not in a cage. Four associates of Vladimir Kvachkov detained Berezhkovskaya Moscow near his apartment. GRU colonel retired, allegedly on the site , “People’s Militia of Minin and Pozharsky” – an unregistered organization, headed by Kvachkov. “Close to Home V. Kvachkov arrested Tatiana Bragin and three other people.” They came to the house Berezhkovskaya in downtown Moscow, when received information about the detention of their leader, “- according to the website. In turn, the leader of the nationalist organization “Slav Power” Dmitry Demushkin said that the organization of Vladimir Kvachkov “Militia” limited and not a serious force. “Today, his people called me at the moment when the detectives broke into the apartment door, where he lives Kvachkov, and requested assistance, but rather the information” – said Demushkin. According to him, the organization Kvachkov “there are a few muddy people, but there does not communicate with anyone.””We met at rallies, but I have long since severed relations with them, because they do not see any reason to continue,” – said Demushkin. Also, for its part, is one of the leaders of the Movement Against Illegal Immigration (DPNI) Alexander Belov said that his arrest Kvachkov was expected. I told him long ago said that the phrase, which he admits is too rigid. But he did not hesitate. I agree with what he does, but the methods he chose, could be interpreted wrongly, “- said Belov. “Against him opened a criminal case is not for specific acts, but for the ideas and words. In our time, to allow such statements, which he said, ihodya of legal practice is very dangerous,” – said Belov. Vladimir Kvachkov himself told reporters that the reason for his new persecution began reading his teammate from Togliatti. “According to those documents which are, in Togliatti, armed with a crossbow for 10,000 rubles, stress, a person sent a group to Vladimir, which was preparing an armed rebellion there,” – said Kvachkov. He explained that the associate was the leader Togliatti branch of the People’s Militia of Minin and Pozharsky. “He was arrested. After 10 days of interrogation, he gave evidence to me” – said Kvachkov, though this person really did not say anything. He could not specify where, according to the investigation, preparing an armed rebellion. “Now we need to read” – added arrested. “It’s the continuation of the events of July 20, when I have been searched,” – he said. Kvachkov believes that his prosecution was initiated by Anatoly Chubais. “The Supreme Court after a nearly 6-year ordeal finally acquitted me,” – said the prisoner. According to him, no evidence that the “Militia” – a terrorist organization, which was preparing an armed rebellion, the investigation does not. “Articles that are imputed to me now, in particular, 205-I (facilitating terrorist activity) have been derived from the competence of jurors. Now everything is rovnenko. Chubais was rebuffed by a jury and went on the knurled pattern,” – said Kvachkov. In turn, associate Kvachkov, a member of staff “people’s militia” Yuri Ekishev told Interfax that this summer, in addition to searches of Kvachkov they were among forty of his associates throughout the country. “After this search, we came to court to get us acquainted with the grounds for investigation. It turned out that Peter Galkin from Togliatti office went to Syzran, there was conducted covert audio recordings, we did not hear. On the basis of such absurdities that’s been concocted excuse for searches across the country, “- said Ekishev. Petra was detained in Vladimir Galkin in the woods with a sports crossbow. He is, “said something about Kvachkov,” said Ekishev. In this case, Galkin, spent in pretrial detention for two days now, still at large. Law enforcement authorities on July 20 held a series of searches of dozens of activists of the All-Russian militia behalf of Minin and Pozharsky in Moscow, St. Petersburg, Samara, Kurgan, and Vladimir, including the apartment Kvachkov.He then called the raids “the present action of intimidation.” “It’s about the attempt on Chubais was stalled, and apparently decided to come up with something else,” – said the colonel. According to his information, searches were conducted in a criminal case against one of the activists, accused of extremism. “He supposedly once called for the overthrow of this government,” – said the colonel. March 17, 2005 at 1,5 km from the village larks Odintsovo district of Moscow region on the roadside exploded controlled explosive device at the time following the official car, which was Chubais, who was at that time the head of RAO UES, and car maintenance with a guard. On suspicion of involvement in the assassination attempt on Chubais on March 19 of that year, was detained by Colonel Kvachkov. March 25 prosecutors charged him. Later, his colleagues were detained by Yashin and found.December 11, 2006 in Moscow, was detained by the fourth defendant in the case of the attempt on Chubais, a history teacher Mironov. On the same day he was charged. June 16, 2009 Mosoblsud on the basis of the verdict of a jury acquittedKvachkov, Yashin and Naidenov. However, the acquittal was repealed by the Supreme Court of the Russian Federation, and the case returned for reconsideration. In this case Mironov, considered until then separately, were merged into one proceeding with the other persons involved. The criminal case was pending in Mosoblsude since March 2006, when the court twice dissolved jury. A second trial at the request of defense also held with a jury. Defendants accused of endangering the life of the state or public figure (Article 277 of the Criminal Code) and the attempted murder of two or more persons who committed socially dangerous way a group of persons by prior agreement (Part 3. 30, Part 2, Article 105) . Kvachkov, Yashin and Naidenov also charged with the illegal manufacture of weapons by an organized group (Part 3 st.223), illegal purchase, transfer, possession of weapons, ammunition, explosives, committed by an organized group (Part 3, 222), and intentionally destroying or damaging property (Part 2, Article 167). [We are a long way from the point where our Afghan follies are admittedly described as mistakes. Even though most of us already understand that we have failed, very few are willing to admit that the entire terror war has been a huge mistake. Just like our failure in Vietnam, there is a time lag of years between the point where we realize that we have lost and the point where we understand why we have lost–because we were wrong all along. Between that future time where we understand our massive error and now, how many more people will die and how many more uncounted billions will be poured down the bottomless pit? If America really had a peace movement, then we would now be witnesses to and participants in a massive effort to save our sinking country by hastening the day of our understanding. Unlike the ending of the previous war, the resolution of the this war will affect our own survival as a functioning Nation. The longer it takes to reach its inevitable conclusion, the worse our chances become to survive the impending economic/military collapse. As long as we keep dedicating trillions to a lost war and trillions more to the corrupt financial centers who have financed that corrupt war (fueled on pure debt), we will have nothing left but austerity to deal with our real problems. If we resolve it more quickly, devoting less resources to futile schemes at “winning,” then the more resources will be available to fix the collateral damage. “We are winning” in Afghanistan, says Gen. David H. Petraeus. President Obama declares that the December military review shows we are “on track.” No doubt the president and the general are right: We will keep “making progress” for as many months or years as we choose to fight what is now America’s longest war – until we finally pull out, in defeat or in political exhaustion, wondering what we have accomplished for all the blood and treasure spent. The president’s review only confirmed what informed observers already know. U.S. troops can win nearly any firefight. But ultimately we are no more secure, and Afghanistan is no closer to becoming a stable and developing country. No matter how light or agile their “footprint,” U.S. and allied occupying forces end up generating as many enemies as they kill, not only in Afghanistan but in other Muslim lands. No matter how much help we give to the Afghan people, inevitably it is seen as being on behalf of a government that is more a kleptocracy than a democracy. How does one measure progress in what should be more accurately described as a counterproductive and now unnecessary war? We’re chasing a diminished band of al- Qaeda terrorists who now pose little threat to us in the forbidding terrain of North Waziristan and Baluchistan on the Pakistani border, while our Pakistani allies cynically buy into both sides of the fight. We’re spending $100 billion a year on a country that had a gross domestic product of a little more than $2 billion when we invaded in 2001. We manage this feat only by helping to fund both sides of the conflict (much of the aid ends up in the hands of the Taliban as well as regional warlords who don’t support the Karzai government). The military focus displaces attention that should be devoted to regional diplomacy and a political settlement within Afghanistan. Instead we are “making progress,” even as the review quietly shifts our departure date from 2011 to 2014. Missing in the president’s review are the actual costs of the war. That includes what economists call “opportunity costs,” or what we miss by continuing this course. By 2014, this administration will have spent more than $700 billion on Afghanistan directly. Poverty is an unfashionable word in Washington, but it afflicts a record 43 million Americans. Childhood poverty is rising. Nationally, only one in seven black male teens held any type of job in the first quarter of this year. We should not fool ourselves: A generation of children raised on dangerous streets is being condemned to a life of misery – hunger, broken families, unemployment, drugs and crime. The nation we are failing to build in Afghanistan is our own. If poverty is too liberal a concern, consider the costs of Afghanistan to our economic competitiveness. America is literally falling apart. Our aged and decrepit infrastructure is becoming a clear and present danger. Lives are lost when a bridge falls in Minneapolis or the levees collapse in New Orleans. SUVs are swallowed by collapsing sewage systems in New York. Children go to schools judged dangerous to their health. Hours are lost when aged train switches freeze, sewer systems collapse or traffic snarls. Even the basics of civilization, such as access to clean water, are increasingly at risk because of aging and leaky sewage systems. Our electric grid, our broadband system and our transportation system all lag behind those of global competitors. Combine the $700 billion spent in Afghanistan and the $700 billion to be squandered on tax breaks for the richest 1 percent of Americans over the next decade, and you have real money, even for Washington. Money that this increasingly challenged country can no longer afford to waste. Notably absent in the commentary about the president’s review, too, are the war’s human costs. The service of those in our volunteer army is routinely praised on all sides. The Democratic Congress under President George W. Bush and Obama committed itself to improving military pay, educational benefits and medical and psychological care. But celebrating servicemembers’ courage ignores the basic question: How do you ask young men and women to give their life or limbs for a cause that you know is lost? Or worse, has no justifiable purpose? The December military review has resulted in a predictable political straddle. The president fulfills his pledge that some troops will come home in 2011; General Petraeus gets a commitment for another four years of occupation before the Afghan government might “assume responsibility.” In the 2012 presidential race, the withdrawals can be advertised to unhappy doves, while the continuing commitment can be used to appease the appetite of hawks. Does Sen. Kerry, now steeped in Washington’s political culture, have the same courage as that young man? Will he stand up, as Fulbright did before him, to challenge a president of his own party in the nation’s best interest? A new generation of young men and women depends on him to lead. [This border dispute in a former Contra hot spot is a modern renewal of US/Nicaragua hostilities. The early deployment of Nicaraguan troops to the area under former Contra/Sandinista “Commander Zero” speaks of hidden intelligence agency agendas, but whose agency? It would seem on the surface to be a Moscow-sponsored prevarication, except for the fact that the man in charge of the operation, “Zero,” Eden Pastora, has worked both sides of the fence in the past. If the Russian/American “reset” is real, and if it applies to the relationship outside of the “pipeline war zone,” then none of this would seem to make any sense. The Nicaraguan occupancy of the Isla Calero will go before the International Court in January. While Costa Rican officials enter the proceedings confident that Costa Rica will win the case, most aren’t considering the alternative: What if the court rules in favor of Nicaragua? 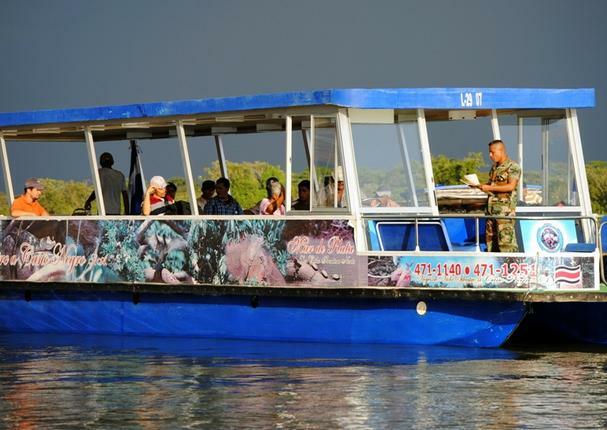 Quid Pro Quo: A Nicaraguan soldier checks papers aboard a Costa Rican tourism boat on the Río San Juan. Nicaragua is demanding navigation rights to Costa Rica’s Río Colorado, in exchange for Costa Rica’s navigation rights to the San Juan River. Costa Rican officials are confident the International Court of Justice at The Hague will rule on their behalf next month in the dispute over Nicaragua’s alleged occupation of Costa Rica’s Isla Calero. But what will happen if Costa Rica loses the case? “The Hague is the final resource that exists for Costa Rica to be able to resolve this issue,” said Antonio Barrios, an international relations professor at Costa Rica’s National University. The case at The Hague is scheduled to begin Jan. 11 and last for two days. The border dispute between Nicaragua, country whose leader is increasingly authoritarian, Costa Rica, a nation known for its pacifism, has already been presented twice before the Organization of American States (OAS), to little effect. The 35-member OAS voted 22-2 agaainst Nicaragua’s presence of troops on the disputed land along the Caribbean coast. But the troops are still in the area and the environmental damage caused by the ongoing construction of an artificial river channel continues. The sentiment among most Costa Ricans is that the law is on their side. But the world court’s decisions will rest more on its interpretation of a 19th century treaty than on Ticos’ public opinion. The fact that the world community increasingly looks upon Nicaraguan President Daniel Ortega’s dictatorial policies with disdain might not have any bearing whatsoever on the case, analysts say. Interpreting the Cañas-Jerez Treaty of 1858 will be a tricky task for the court. Nicaragua’s claim to the area is based partially on the Caño Sucio, a small tributary that branches off the Río San Juan into Nicaragua. The land north of Caño Sucio, an area called Harbour Head, belongs to Nicaragua, officials from that country say. Nicaragua also claims that the Río San Juan has changed course over time, and that the original mouth of the river was at Punta de Castilla, on the Caribbean coast. If the world court agrees, the northern tip of Isla Calero could be declared Nicaraguan territory – even though Nicaragua says it’s a separate island, and not part of Isla Calero, which Nicaragua says it has no claim to. That decision would be a stunning blow to Costa Ricans, and an incredible political victory for Ortega and his Sandista administration. Costa Rica will tell the court that Nicaragua’s occupation of Isla Calero is an “invasion,” and will argue that Nicaragua has violated Costa Rica’s national sovereignty. Presenting the case to the world court will also be costly. An estimate by Costa Rica’s Foreign Ministry put the price tag of taking a case to the world court at $2 million per year, but that figure may be exaggerated. However, some experts believe the Isla Calero case could drag on for years. Last week, OAS Secretary General José Miguel Insulza presented pictures taken by OAS representatives in late November that provide evidence of further land changes at Isla Calero. Nicaraguan crews have cut down trees and etched a water channel from the Laguna de los Portillos to the Río San Juan. One overhead photo shows a long, canal-shaped deforested swath of land that is gradually filling with rain and seawater. This is not the first time the two neighboring countries have met at The Hague to settle a dispute. In 2009, the court ruled on Costa Rica’s rights to navigate the San Juan, which forms the border between the two countries. That case took four years to resolve and cost $1.6 million. Meanwhile, Nicaragua seems to be preparing an alternative strategy. On Tuesday, Sandinista lawmakers and their allies approved a package of national defense and security laws that will further militarize the country, especially the border region around the San Juan River (see separate story in The Nica Times, Page N1). Ortega’s military bolstering has not interrupted Costa Rica’s pursuit of diplomatic dialogue. Even the World Court’s previous ruling seems to indicate Costa Rica has the advantage. Several countries have ignored world court rulings, including the United States. In 1984, the court ruled against the U.S. government and in favor or Nicaragua over U.S.’ illegal war on Nicaragua. The United States was ordered to pay reparations, but never did. Ortega continues to demand payment until this day. Costa Rica’s other international option is to take the issue to the UN Security Council. Ignoring a resolution there can result in trade sanctions and other measures. “We will still pursue diplomatic dialogue with Nicaragua as a means to pressure them into finding a resolution,” Marín said. “I advised President [Laura] Chinchilla to also apply pressure through allies that exist in both countries, including those that have companies and environmental organizations in Nicaragua, such as the Netherlands,” she said. Currently, 14 cases are pending in The Hague and priority is given to those filed first. Chinchilla, meanwhile, continues to press for peace. At Costa Rica’s annual Festival of Lights last weekend, she said her primary goal for 2011 is to restore national peace. “We will continue to look for a way to restore peace and calm, and take whatever steps necessary to do so in 2011,” she said.